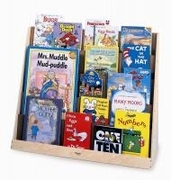 Five overlapping shelves for displaying children's books. The Book Display Stand Can be placed on the floor or on a counter. Ships fully assembled by UPS or Fed Ex Ground. Made in the USA. Greenguard Certified. Dimensions: 12in. × 36in. × 30in.